At least 900 Christian churches have been destroyed at the hands of Boko Haram in northern Nigeria, as part of the Islamic radical group's campaign to drive out all Christians from the north, the youth wing of the Christian Association of Nigeria reported. 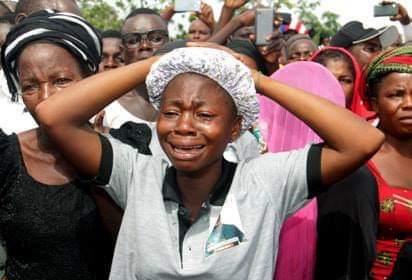 CAN said that the "carnage" being carried out against Christians is "not accidental," and argued that continued attacks in Southern Kaduna, Plateau, Benue, and Taraba communities show that Boko Haram's war on followers of Christ, which started in 2009, continues in full force. According to The Daily Post, the comments were made after the National Executive Council meeting held in Gusau, Zamfara State, with the youth wing chairman, Evangelist Musa Misal, urging the rebuilding of over 900 demolished churches. CAN further called on the government to step up its protection of civilians, which was echoed by persecution watchdog groups like International Christian Concern. "Christians continue to be the main and constant target of Islamic radicals like Boko Haram and Fulani militants without any hope of ever being protected or for the authorities to bring justice," ICC said in a note, referring also to the Fulani herdsmen, a separate Islamic radical group that reportedly killed over 800 Christians and moderate Muslims in the last half of 2016. Some prominent Christian leaders, such as CAN Chairman Bishop Diamond Emuobor, have suggested that if there is no one to protect Christians and their churches, then they must "buy a sword" and start protecting themselves. "Christians should defend themselves and he who has no sword, should sell his coat and buy one to defend himself. We are all human beings, nobody should catch you like a snail and slaughter because you believe in Jesus Christ," Emuobor said last week. "We all would not die and those of us, who are alive, have the right to defend ourselves. Jesus says in the book of Luke that those who have no sword should sell their coats and buy one for the defense of their lives," he added, referring to Luke 22:36. Boko Haram, which pledged its allegiance to Islamic State in 2015, has been slaughtering both Christians and moderate Muslims in its war against the government, raiding villages and towns, kidnapping women and children, and forcing its victims to carry out suicide bombings. BBC News reported last week that the jihadists have now even taken to using babies as part of their suicide attacks. Two women disguised as mothers and holding infants carried out such a bombing on Jan. 13 in the town of Madagali in Adamawa State. Nigeria's population of 180 million is equally divided between Muslims and Christians, according to the U.S. Commission on International Religious Freedom, and is composed of more than 250 ethnic groups. The vast majority of the population of northern Nigeria identifies as Muslim, and primarily is from the Hausa-Fulani ethnic group.